With six minutes remaining in the game and trailing by three, the Alamogordo Tigers were desperately fighting to keep their undefeated season alive. 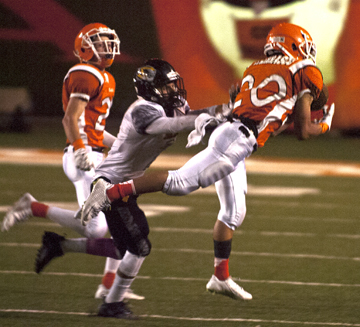 Artesia corner Carlos Carrasco had just snagged an interception that briefly took the wind out of the Tigers’ sails, but on second down from the Bulldog 37-yard line, Isaiah Saldana returned the favor to give Alamo the ball deep in Artesia territory. The Tigers went quickly to work, with quarterback Kyle Hooper completing four of five passes en route to a first-and-goal at the Bulldog five, from which Saldana would continue what he started. A four-yard run was followed by a one-yard plunge over the goal line to put Alamogordo back in front, 30-27, with 3:19 to play. What had been a hotly contested battle between two of the top teams in the state from the opening horn was about to end the same way it began. Over the course of the bout, the crowd at Bulldog Bowl had borne witness to an offense finally beginning to gel around sophomore quarterback Taylor Null in his second varsity start. They’d twice risen to the occasion in the face of the Tigers’ furious second-half charge. Now, as the volume from both sides of the field amplified, it was in their hands. A quick 22-yard pass from Null to Darius Ramirez propelled the ‘Dogs into Tiger territory, and a 13-yard run by Ethan Duff gave them another first down at the 30. On third-and-nine, Duff struck again, darting 12 yards to the 17. Null, who’d been sacked six times on the night, declined a seventh, dodging a would-be tackler and barreling to the outside for a nine-yard gain. 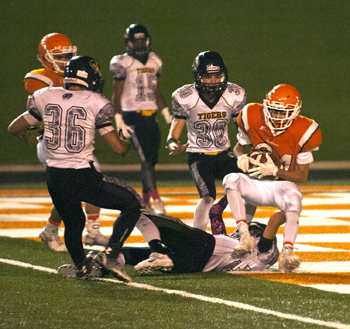 From there, Isaiah Weideman would cover the final eight yards on three carries, the last a one-yard touchdown up the gut to give Artesia the lead with 39 seconds remaining. The PAT by Jharyss Granger made it 34-30 and meant the Tigers would need no less than six. Hooper came out firing, finding Carlton Bartley and Alex Ramirez to breach Artesia’s half of the field, but the junior was chased down in the backfield by lineman Codey Scott for a loss of eight on the next play. An incomplete pass brought about third down and a 13-yard toss to Julian Segura wasn’t enough, but on fourth-and-13 from the 36, Hooper connected with Ramirez for a first down at the 29 with one second on the clock. The QB launched to the corner of the end zone, but the Bulldog secondary was there. Carrasco positioned, pounced, and brought a fitting end to what had become New Mexico’s Week Seven showcase. 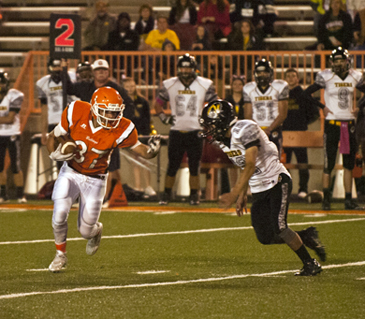 He was promptly mobbed by the Artesia sideline. The ‘Dogs would have impressed regardless of the outcome. An offense that struggled mightily to establish a flow and finish drives last week against Las Cruces High made plays when the chips were down, and the Orange Crush defense held an Alamogordo squad that had hung 324 points on its first six opponents – no less than 46 in any game – to 30, blanking the Tigers in the first half of play. 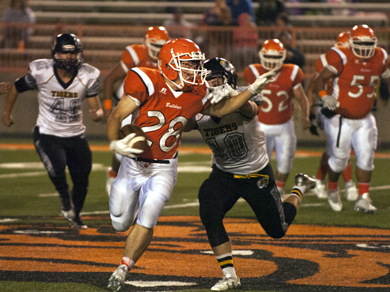 Things didn’t get off to a positive start for the Bulldogs, who fumbled the first offensive play of the night, but safety Caleb Brewer would pick Hooper at the Artesia 19 to thwart Alamo’s inaugural series. 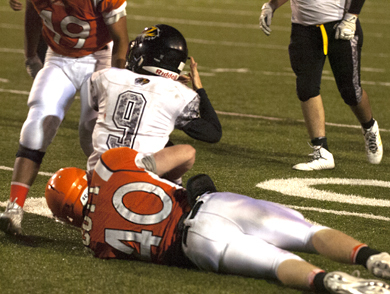 As the ‘Dogs’ offense continued to sputter – going three-and-out in their second possession and turning the ball over on downs in their third – the defense held strong, forcing a pair of Tiger punts as the game moved scoreless into the second quarter. There, Null and his receivers seemed to finally click. The sophomore sprinkled short, efficient passes to Daniel Hernandez, Clay Donaghe, Kaymann Elston and Daniel Leon on an 84-yard march to the Alamogordo one, from which Weideman would secure his first of three rushing touchdowns with 8:54 to go in the half. Another turnover on downs by the Tigers gave way to the ‘Dogs’ second scoring drive, an eight-play, 59-yard predominantly passing effort that once more ended in a one-yard Weideman run with 4:07 on the clock. The Crush would stymie Alamo again, this time in the red zone, to keep the score 14-0 in favor of Artesia at the break. To that point, the Tigers had managed just 123 total yards of offense against the Bulldogs, 55 rushing and 68 through the air. But following a presumably energetic halftime pep talk, Alamogordo went on a third-quarter tear. Alternating between Hooper passes and the legwork of running back Hunter Graham, the Tigers kicked off the second half with a 69-yard scoring drive that ended in a 20-yard pass from Hooper to Segura. Hooper ran in the conversion to make it 14-8 with 8:50 left in the third. A quick turnover on downs by the Bulldogs was followed by the Tigers’ second score of the night, a one-yard run by Graham, who took in his own conversion, as well, to give Alamo a sudden lead, 16-14, with 5:30 on the clock. 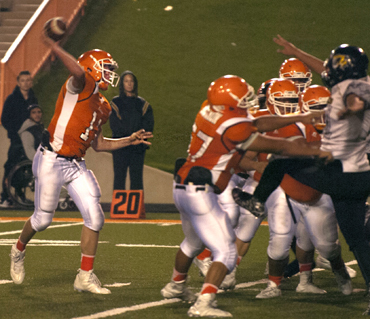 Artesia was forced to punt, but the defense would stiffen, preventing a pair of Hooper passes for a three and-out. And following a 37-yard run from midfield to the Alamogordo 13 by Duff, Null would find Donaghe for a 13-yard touchdown pass to regain the lead despite the blocked PAT, 20-16, with 21 seconds to go in the third. Alamo carried a long, 16-play drive well into the fourth quarter, converting twice on third down and once on fourth before Hooper crossed the goal line from the two. His pass to Ramirez made it 24-20 Tigers with 7:55 left in the game. At that point, the Tiger faithful were on their feet and highly audible, but they would be drowned out 22 seconds later when Duff took the handoff at the Artesia 33 and pinballed his way 67 yards to paydirt to quickly return the three-point edge to the ‘Dogs, 27-24. Carrasco’s interception one play later set the stage for the dramatic finish. “I think we came up with the plays we needed at different times throughout the game, and that’s the mark of a good football team,” Henderson said. “Just as far as team focus, working together, and those type of concepts, we made a lot of progress. Null finished 26 of 39 for 278 yards and one touchdown on the night while Duff was 7-148 on the ground with one score and 5-50 receiving. Weideman was 7-9 rushing with three TDs, Daniel Leon caught five passes for 76 yards, and Donaghe was 6-56 receiving with one touchdown. For the Tigers, Hooper was 27 or 44 for 239 yards with one touchdown and three interceptions. Graham led the ground game with 24 carries for 74 yards and a TD. “Our defense last night at times shut down a good offense,” said Henderson. “We had quite a few times we were able to limit them to three downs and out, and those plays made a difference for us. Friday’s victory put the ‘Dogs at 6-1 on the season and put an exclamation point on the team’s regular season. Artesia will be open next week before kicking off District 4-AAAAA play Oct. 23 against Roswell High at Wool Bowl. “We still have plenty to work on and plenty to get better at, but this is one game we really think will help us in the big picture of our season, and I think playing a really quality opponent like Alamogordo made us a better football team,” Henderson said. “This win really gives us a lot of momentum going into the open date, which is something you really like to have before you open up district play.